E-bikes, electronic pedal assist bikes, have exploded in popularity in Europe, and for good reason. They make cycling accessible to a wider range of the population. On a bike tour they can make choosing a trip easier when a couple or friends of different cycling abilities want to cycle together on the same trip. Requests for E-bikes on our tours have been increasing year after year and we’ve tested out different models. We’ve found that while there are many benefits, there are also several drawbacks. E-bikes are typically big, clunky awkward machines and they are much heavier than a hybrid bike. That means that when a rider is not using using the extra power (on a flat section, for example) they are exerting much more of their own power to move these giant machines. For guides, storing the E-bike in the van once a rider is done takes much more time. We decided to search for a better solution. 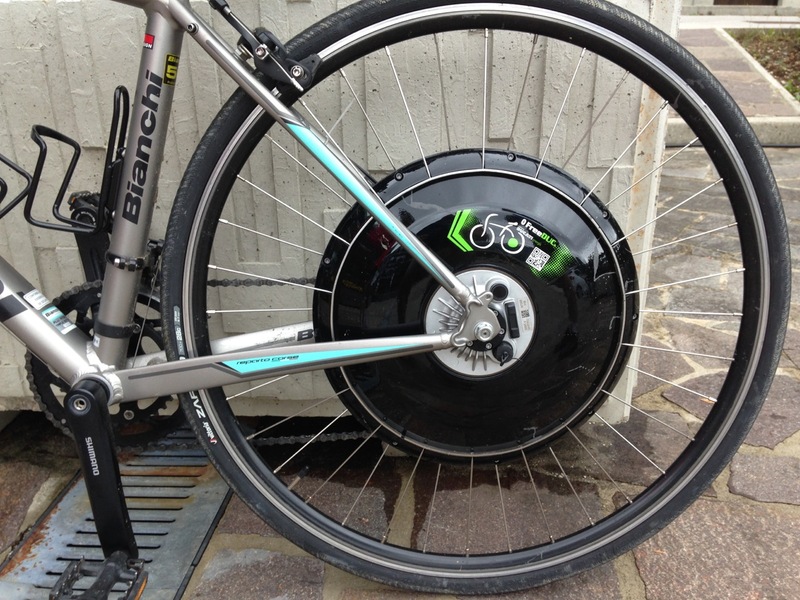 What we’ve found is the FreeDuck, an electronic wheel that contains all of the parts and power inside the hub of the wheel. Made in Italy by the Electronic division Ducati (the motorcycle company), it is sleek, stylish and powerful! It quickly and easily turns any of our Bianchi hybrids into an e-bike and while it’s still heavier than a standard wheel, it’s not nearly as hefty as a traditional E-bike. It looks nicer, too. As you pedal, the wheel measures the amount of energy and intensity you are applying, and applies the proportional amount of assistance. There are five levels of assist, and these can be adjusted using a smartphone. The wheel connects wirelessly to your phone using Bluetooth. 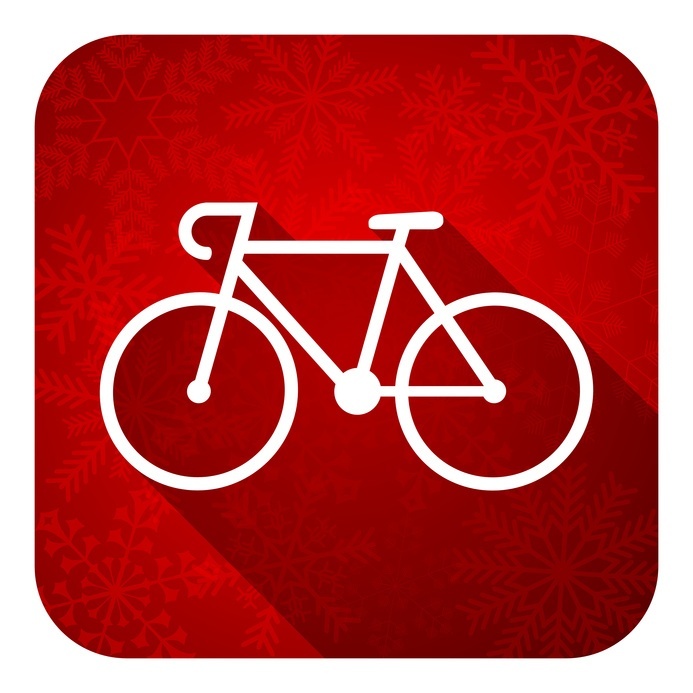 It’s not necessary to use the app to make the wheel function, but it can help if you want to adjust the power output. 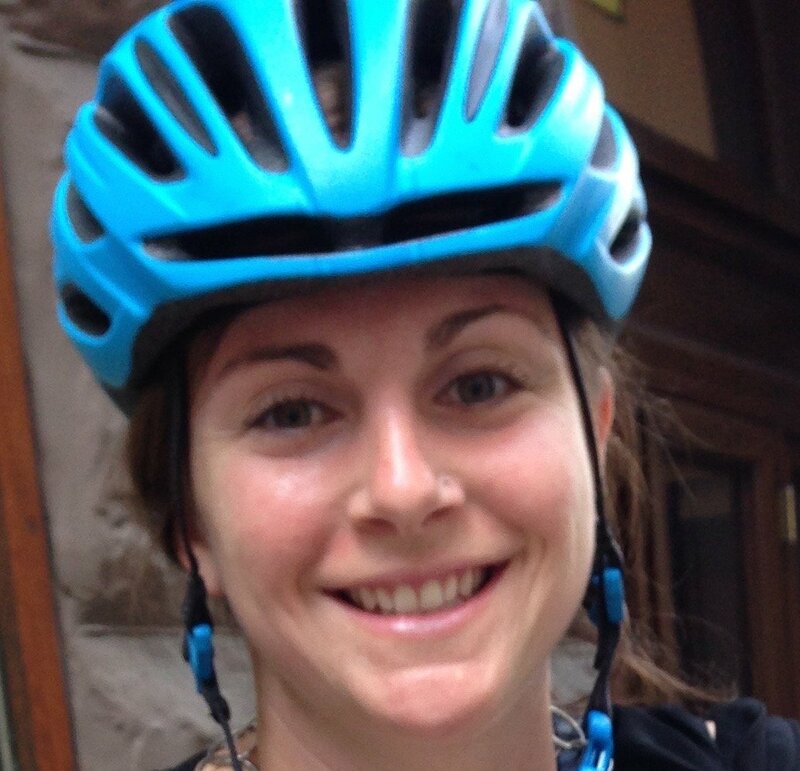 I was the first to try the wheel out, on the flat streets of Turin. What I noticed first was just how powerful the wheel is! Even when tackling a challenging climb that you would encounter on one of our tours there is usually not a need to set the power over level 3 if you want to stay with your friends. “Special thanks for the marvelous, magic Ducati wheel! As I said repeatedly, now I could enjoy the biking just as much as the sights and the friends we were with! 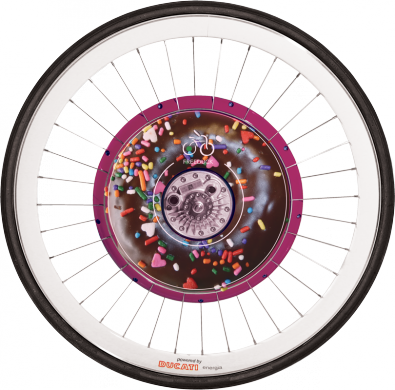 :)” -Kathy F.
The E-wheel will be available on all of our 2018 road cycling tours, and it will have a custom design (but not a donut). Get in touch if you want to rent one for your tour or find out more.